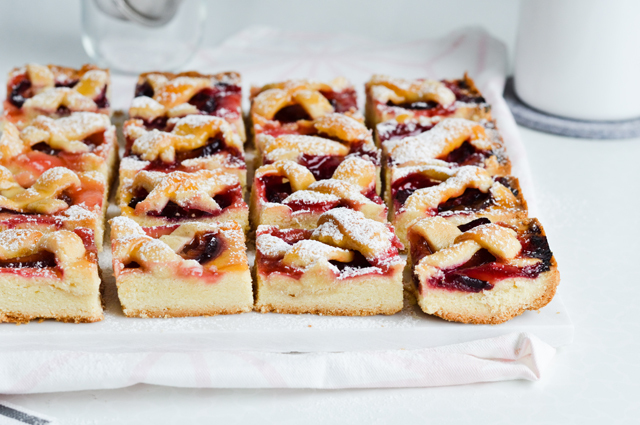 Buttery plum pie bites are cookie bars and buttery pie in one! 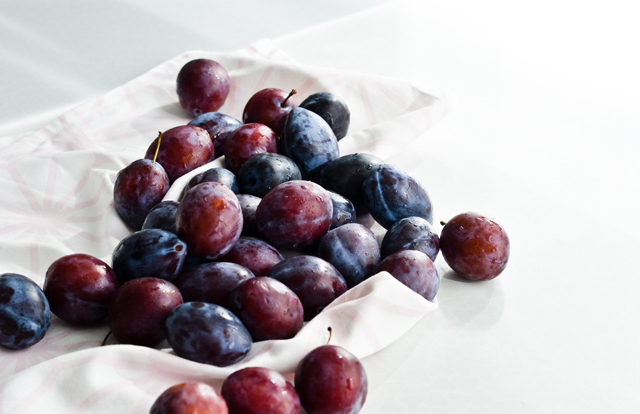 I was going to start this post by telling you all about plums and how they’re the best thing you can have during this season, and how I didn’t even like them as a kid, but then life happened. And now I don’t feel like writing about plums anymore. I got a call from a card management center and the woman on the other end of the line informed me of some odd transactions made with my Visa card. I didn’t notice anything myself, so I was shocked by it all. And confused and by the end of the day pretty pissed. Card fraud when I’m really careful? When I rarely even use the card? When there are codes you need to enter that are supposed to protect you? What the hell? Well apparently this still happens and it can happen to anyone. Born a realist that gets pessimistic at times, I didn’t expect too much on my way to the bank. I was already in a crappy mood expecting it to get worse. And then I met the nicest bank employee ever. It’s wonderful what a difference some stranger can make in your day. It’s why I always try to be nice because you never know what someone is going through. I know bank employees should be nice, it’s part of their job, but not everyone always is. But this girl was really nice, not much older than me and she really helped me out. I left the bank happy! I don’t know if that’s ever happened before. Whether I’ll get my money back or not is another story, but I didn’t even think about that for a while yesterday because of that girl. 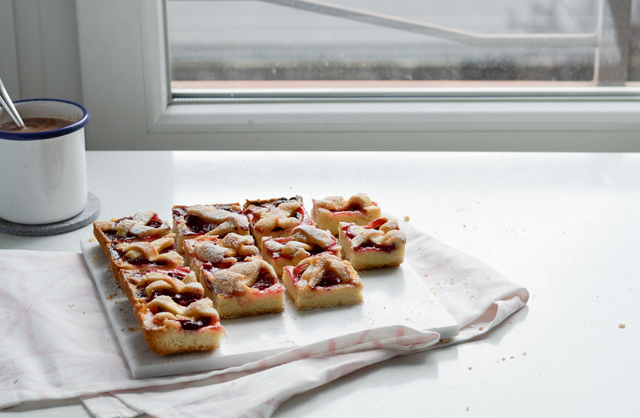 If you were having a bad day, I’d invite you over for a cup of hot cocoa and these incredible buttery plum pie bites. Good food and a chat make everything better, right? Or if you live too far, I’d send you this recipe. If you ever feel stressed, my advice is that you go make some dough. Seriously, kneading is very therapeutic. And you end up with something tasty in the end! If that’s not enough you can always go out for a run later. 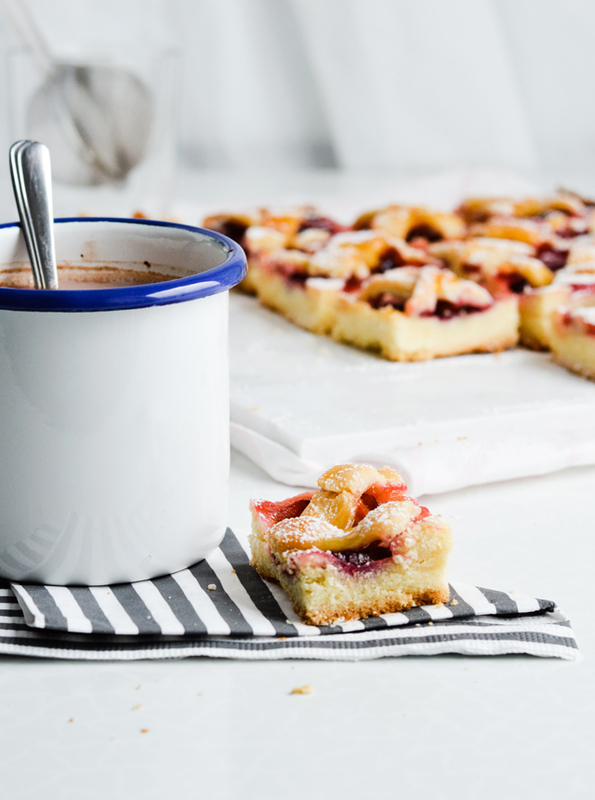 I personally absolutely adore plum pie and indulge in it every Fall, but I also really enjoy having small sweet snacks that go well with coffee or cocoa too. Cookies are the easiest choice, but can become boring sometimes. 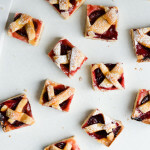 My vote goes to these buttery plum pie bites, because they’re everything I want right now: small, buttery, sweet. Something between a slice of pie and a butter cookie. 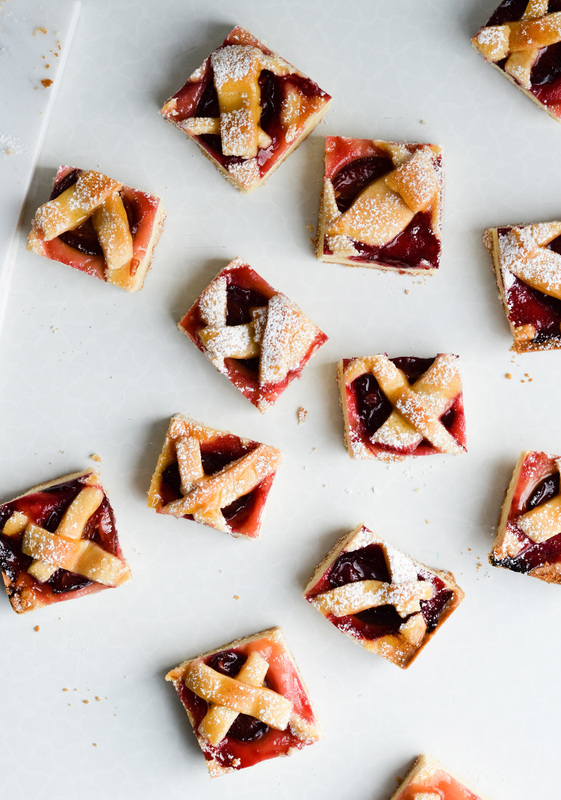 These plum pie bites are the perfect addition to any gathering. In your food processor combine the flour, sugar and salt. Add the butter and pulse until you get a crumbly mix. Transfer to a large bowl. 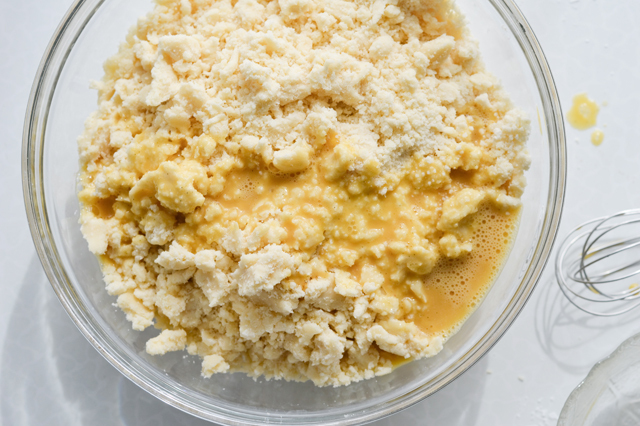 Whisk the eggs, add vanilla and pour over the crumbly mixture. With a spatula, or with your hands, stir all the ingredients together until you form a solid ball of dough. The dough should be soft, but not overly sticky. If it is, keep adding flour until it’s smooth. Flatten into a disk, wrap in plastic wrap and chill in the fridge for 60 minutes. Place a rack in the middle of the oven. Preheat the oven to 180°C (356°F). 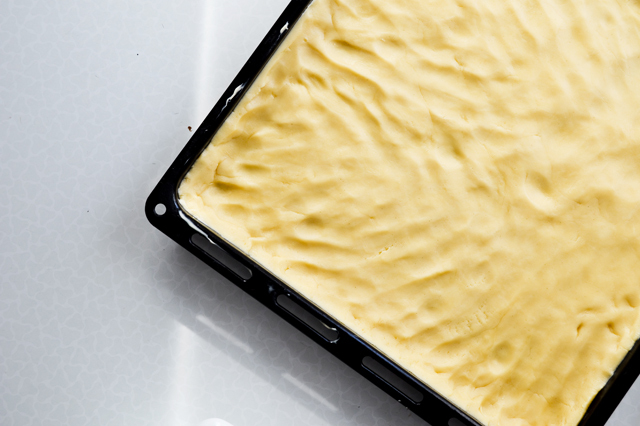 Butter a 30×30 cm (12×12-inch) baking pan. Take 2/3 (two-thirds) of the dough and transfer it to the pan. Stretch it out and press it into the pan with your fingers as evenly as you can. 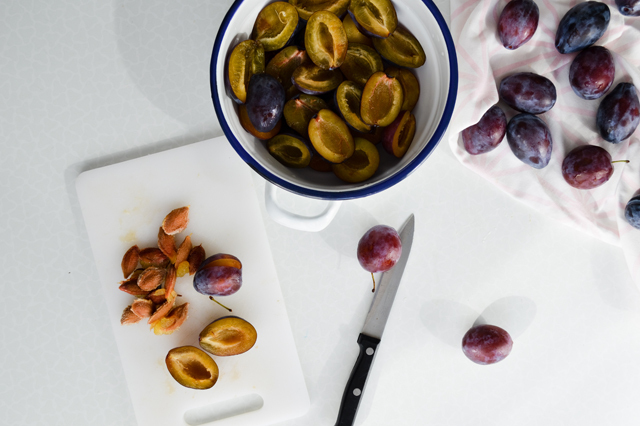 Spread plums all over, with the sliced side up and about 1.5 cm (0.5 inch) apart. Sprinkle with granulated sugar and cinnamon. 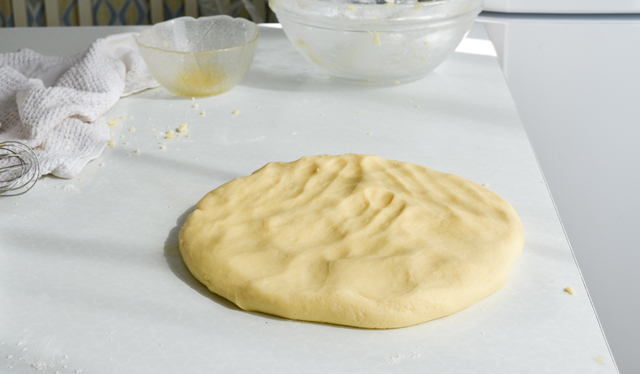 Lastly, flour your working surface and roll out the last 1/3 of the dough. Slice it into strips and gently lay them over the pie to form a net. 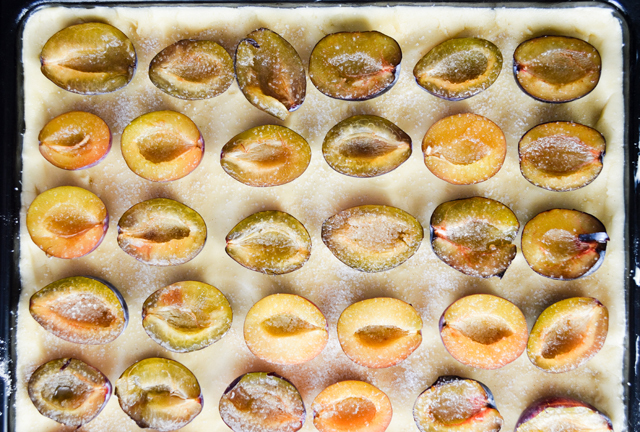 It doesn’t have to be perfect, as you’ll cut the pie later, you just want each plum to get some of the dough. 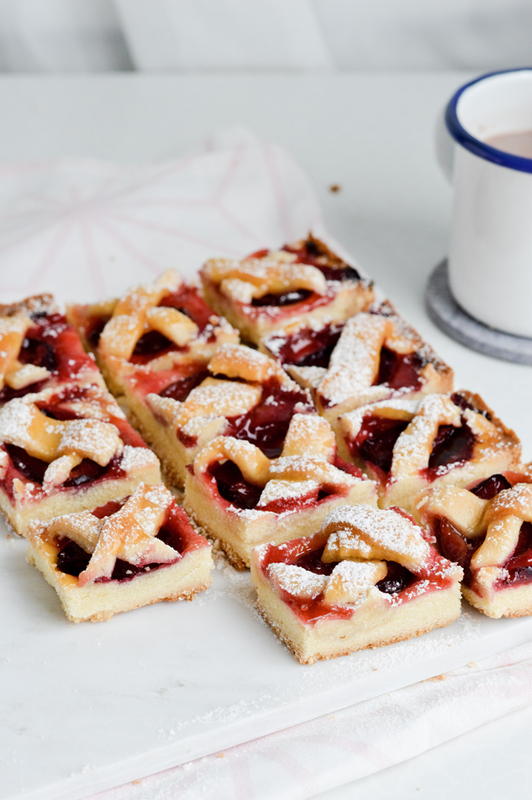 Bake the pie for 45-50 minutes until the dough is golden brown and plums soft. Remove from the oven and chill completely. Brush the whole pie with the jam and let it cool completely. 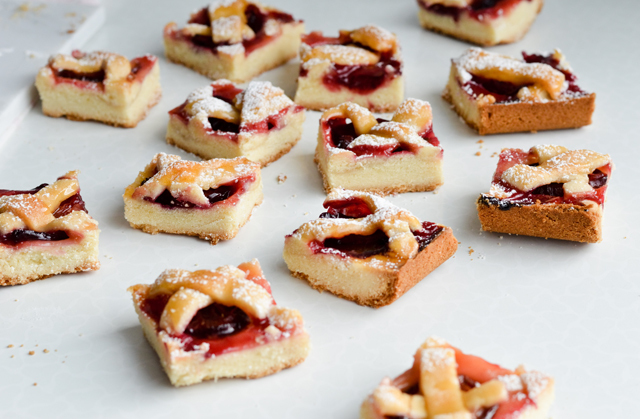 Cut into bite size pieces, with only one plum per square and sprinkle with powdered sugar before serving. Store at room temperature in an airtight container for up to 3-4 days. Storing in the fridge is okay too. While the apricot jam may seem unnecessary, it really adds an extra layer of flavor. It sweetens the plums and makes the whole pie shiny and pretty. You can use other flavors you might like. You can easily make a regular pie by using a smaller baking pan. You can also add more plums, one next to the other, just use more sugar too. Recipe adapted from Kaffeehaus: Exquisite Desserts from the Classic Cafes of Vienna, Budapest, and Prague by Rick Rodgers. I want to share this recipe with you . It’s name ( CHEESY ROLLS ).It’s awesome and it’s also very tasty . You also love these rolls . First put some of the plain flour as you want . Put 1 tablespoon oil in it and also 1 tablespoon salt. Then mix it properly with your hands . Make it in plain shape . Convert iI in the shape of square . Then cut some some vegetables in small pieces such as ( carrots , peas ,potatoes , bell pepper)and steam them.cut chicken in small pieces and add cheez and also put some black pepper . It makes good taste . Mix them all together completely . Now turn to put this all mixture in the square shape. Mix some oil and 1 egg . And put this on both sides of square . Now roll them all . And fry it in the oil .this is complete now .